Will Silver Make a Comeback as Legal Tender? Evangeline writes: I have recently started with your monthly gold/silver accumulation program. I do have some concerns, as I am not sure how this will help in the event of the dollar losing all its value. I also have a small amount of silver that I came by over the years. 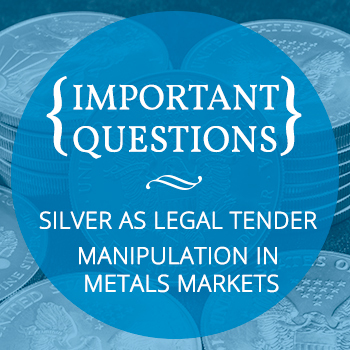 Will silver ever be used again as legal tender? Or will I have to sell it? How difficult will that be when things fall apart, like delivery of mail? What will I sell it for if the dollar is gone? Actual silver coinage may never be officially reintroduced into circulation. Governments around the world are moving to drive out even paper money to create a digital economy. There's a reason why there are no $1,000 bills or $10,000 bills anymore. The government wants to make it impracticable to pay for large purchases in cash. Bills and coins represent only 7% of all economic transactions in the U.S. and as little as 3% in Sweden, where public buses don't accept cash. Governments want all transactions to be electronic (credit cards, debit cards, smartphones, etc.) so that all purchases can be automatically logged and traced back to individual purchasers. This excellent article by Guy Christopher discusses the question of “spending” your gold and silver. But short of a currency collapse, it’s likely that silver-backed and gold-backed currencies (both private and governmental) will be integrated into the electronic economy through debit cards, etc. That would make directly spending your gold and silver seamless. As for your other questions, keep in mind that silver's real value exists independent of the dollar's value. There never has been and never will be a time in the history of civilization when silver ceases to be a store of value. Whether you use to it directly as money in a barter transaction or sell it for whatever the exchange rate happens to be in whatever currency you pay your bills in, silver will be widely recognized and accepted. You can always sell your gold and silver to local jewelers, pawn shops, or coin shops or to major national dealers such as Money Metals Exchange. It’s super easy to sell your precious metals to us. We will generally pay you the spot price of the metal at the time or a fair bit more, depending on the item and on market conditions. Henry asks: The amount of physical metal in COMEX vaults available to deliver on futures contracts has been exceptionally low for some time. However, recent data shows this problem suddenly becoming even worse. As of last week, over 200 ounces of paper gold are trading for every ounce of physical gold in the vaults. What happens when these contracts come due? Don't they have to come up with the physical metal? In effect, the commercial short sellers who hold an inordinately large position in the futures market don't have to deliver the metal they've sold. The contracts are almost always settled in cash. If all "longs" demanded delivery of the metal, which they are entitled to do, then the COMEX futures exchange would have a problem on its hands, because there is nowhere near enough gold (or silver) in reserve to meet that kind of demand. However, in a delivery default situation, the COMEX can allow a settlement in cash, even though the credibility of the COMEX (and the electronic markets generally) would certainly be damaged. The danger that an investor may not be able to secure delivery of his metal is one of many reasons why the futures market is a lousy place to be. It is possible this massive and growing leverage in precious metals futures is part of the reason why paper gold and silver have not gotten much safe-haven buying in recent weeks. Most of the buying in precious metals has been concentrated in physical bullion at the same time there has been huge amounts of selling on paper. Take heart. If prices remain artificially low, the availability of physical metal at these prices will dry up, and this disconnect between the paper and physical markets will be reconciled. For now, you have the opportunity to accumulate physical metal at discounted prices (while it’s still available). For more on the subject of manipulation and why it will ultimately fail, go here.